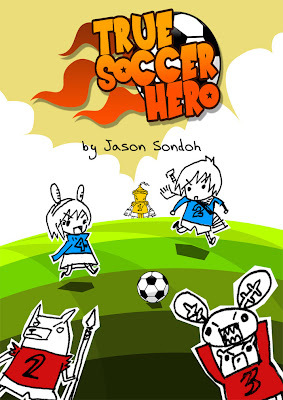 True Soccer Hero is a two-player fantasy soccer board game of clever management of players on the field, tight score difference, and an always fun easy-to-teach game of soccer. Managers(the players) must carefully plan their tactic on getting pass through the defence and eventually score a goal. The game take about 15+ minutes of intense and exciting game soccer. True Soccer Hero is a print-and-play game in which managers taking turns roll the dice and based on the given result managers make a clever strategy that can get pass through the opposition goal line. Wahhh cute artwork. New game ;) Lets play.